Recently I got to play the new word game KWIKORD: a creative blend of all the good parts of crosswords, Bananagrams, and Scrabble, with none of their tedium and with a more authentic challenge. I'll be sharing an abbreviated version of this game within issues of Make Your Point soon, which is super-exciting. I also got a chance to chat with Wayne Ellice, the game's creator. Below, he patiently answers all my burning questions about KWIKORD. Enjoy! As a note for readers, Wayne has a degree in engineering and worked in the petrochemical industry before retiring recently. So Wayne, you are kind of the last person I'd expect to invent a word game! What's the thread that connects KWIKORD and engineering? I'm not a good speller and certainly not a word expert. But I love challenging games of all kinds, like chess, Scrabble, crosswords, and bridge. I guess the connection is solving a problem. There is some delight in figuring things out, making things work or finding the correct answer. For me, competing against others or getting a high score is a lot of fun. How did you come up with KWIKORD? I was literally doodling while attending a boring meeting. After drawing a mini-grid of boxes, I started to think of crossword puzzles. I wrote down some random letters and tried to create some words with them and see if I could fill the grid like a crossword. I then hit upon the idea that this could be a unique puzzle (i.e. one without having a clue for every word). It actually seemed more challenging than crossword puzzles. There were many variations and changes before the final game came together. Is KWIKORD the first game you invented? My first creation was an abstract strategy board game (played on a specially designed board using pieces of particular shapes). I made a high quality prototype. I called it JUXT. Although there was some market interest, I was told it was too similar to Blokus, which was about to be introduced to the US market and went on to become a big hit. I couldn't get JUXT licensed and I never pursued manufacturing. KWIKORD became my next endeavor. Who is KWIKORD for? I found it pretty challenging, but how hard would you say it is? How would you say it compares, challenge-wise, to Bananagrams or to Scrabble? Great question. Bananagrams is more of a fun, not particularly challenging word game. You grab your tiles and hope for good letters. A very nice, easy family game. Scrabble, of course, is the standard for challenging word games. There are tournaments held around the world. I actually specifically developed KWIKORD to remove, what I considered, the downside of Scrabble: (1) waiting for your turn; and (2) being lucky enough to draw good letters. KWIKORD is equally as challenging as Scrabble, but different. Despite loving board games, the more complex the better, my husband kind of hates word games. What can I tell him about KWIKORD to persuade him to play it? I wish I had a good answer for this. I'm the only one in my family that likes chess and golf, despite my efforts. A friend of mine, who is a rated expert, pays a coach to teach his son chess. I guess it sometimes takes an independent third party. I made a mediocre score when I aimed to make long words, then scored higher when I aimed for all short words. Is the latter the best strategy? Beyond the four strategies suggested in the back of the game booklet, could you share some more? Yes, it's extremely helpful to use short words and bunch them to read across and down. And as they say, practice, practice, and more practice. Bottom line, simply enjoying playing the game can't help but improve performance. I've gotten 108 a few times. But I think professional Scrabble players can do much better. I have one such friend who beats me regularly. Any plans in the works for making versions of KWIKORD for kids or for those learning English as a foreign language? Yes, there are these and other possibilities. I will dive into them if this first effort is successful. Have you heard of anyone forming KWIKORD groups, clubs, or competitive teams? Perhaps it's a bit early for these types of groups. I do know there are meet-up groups (www.meetup.com) for almost any activity. 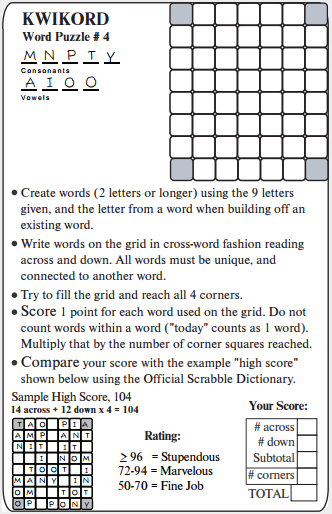 I've attended some of these geared to word games and have really enjoyed them. Truth be told, as a word lover with a meticulous personality, I'm addicted to this game. Are you getting the same kind of response from friends and family who've tried it out? What are they saying about it? Nothing but very positive feedback. In fact, the response has been so positive, it is the main reason I'm producing them.